When I was in high school, a team of plant technicians from the Bureau of Plant Industry visited our school. They were to show a demo on various plant propagation techniques. I no longer remember what school subject that was, but like any other kid I was just happy we were in the audio-visual room for a change, instead of the usual classroom. I remember the technicians supposedly show how you can make identical plants from an existing one. They had a live potted plant on a demo table and proceeded to show air-layering (or marcotting) and propagation from cuttings. I was incredulous of course. 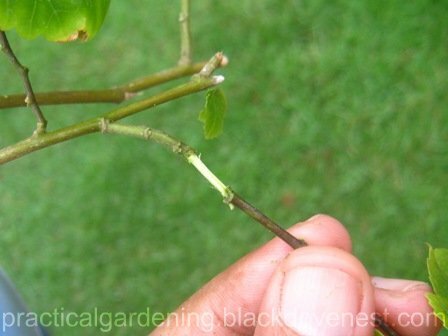 But I was a bit doubtful also especially after the technicians said it will take a few weeks or months before the marcots or cuttings would actually take root. Many years, nay, decades later, I'd learn air layering is so easy to do and yes, it works. The formation of adventitious roots during air layering is induced by various stem treatments. 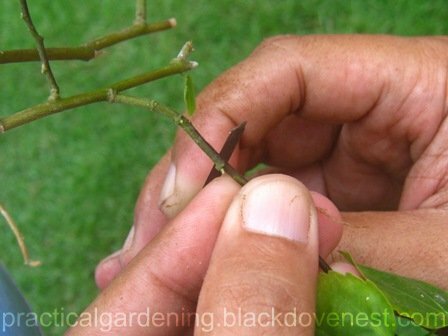 These generally involve the girdling or wounding of a small part of the stem, resulting to the interruption of the downward movement of organic materials such as carbohydrates, auxin and other growth factors from the leaves and shoot tips. These materials accumulate close to the treated area and rooting follows. Continuous moisture, sufficient aeration, and moderate temperatures in the rooting zone affect the formation of roots on layers or marcots. 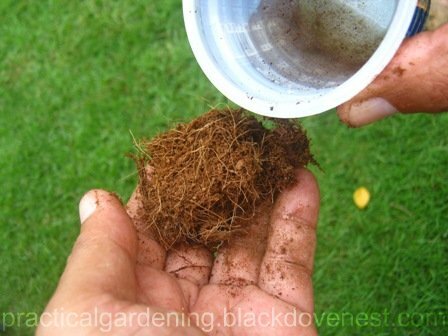 These conditions can be provided by using a loose rooting medium with high water holding capacity such as a sphagnum moss or coconut coir/dust. It has been observed also that the rainy season favors rooting rather than the hot, dry season. The application of rooting hormone to the injured stem is sometimes effective. This can be applied in powder form, lanolin, or as a dilute solution. 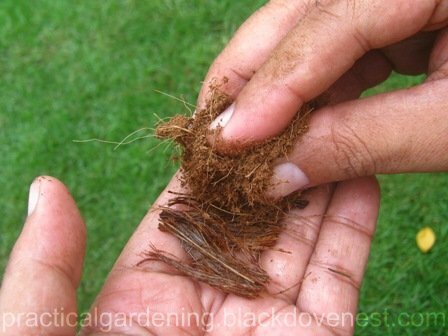 Rooting success likewise depends on the plant species. 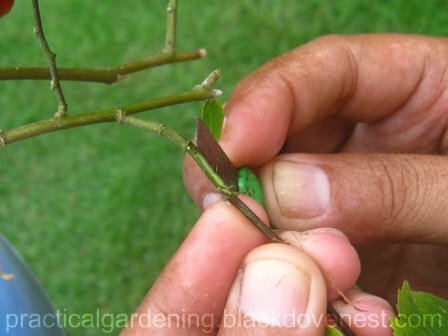 In general, plants which can be propagated using stem cuttings will also root through air layering. 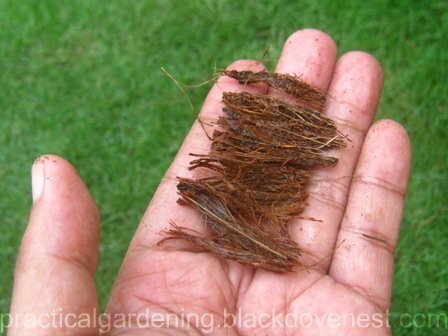 Prostrate stems of some plants which naturally root at the point of contact with the soil indicate that these plants can be easily rooted using this method, as with stem cuttings. For a detailed explanation of the above items, please refer to the contents of my marcotting Kit. 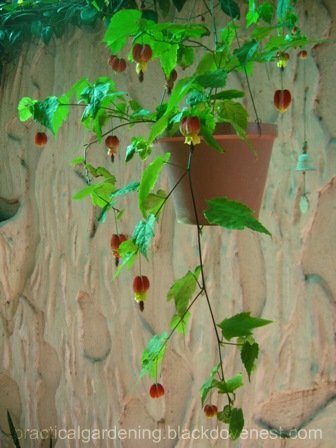 Here, I chose a Chinese Bell Flower plant, sometimes called Chinese Lantern (Abutilon megapotamicum). 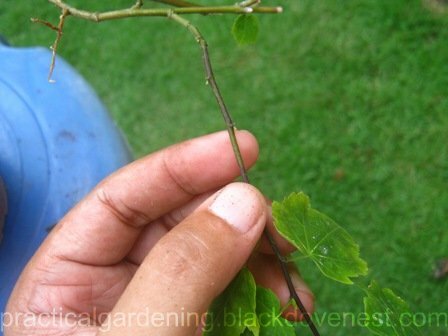 This plant has thin, woody stems that's quite easy to marcot. Make two parallel cuts (bottom cut and top cut) about 1/2 to 1 inch apart around the stem and through the bark and cambium layer. 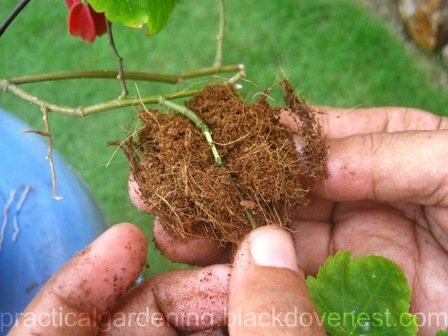 "Bottom" here refers to the part of the air layer wound closer to the plant roots. 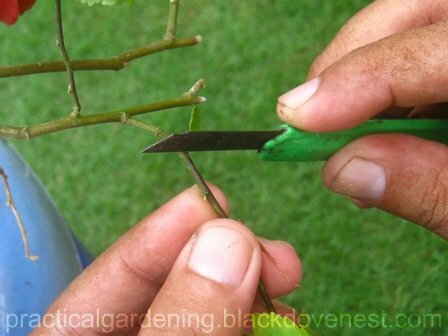 Use a sharp knife to cut around (ring cut) the branch's perimeter. Hold the branch firmly but not tightly to avoid breaking the branch. Prepare a piece of coconut husk that is about 1 1/2 inches wide and around 3 inches long. This piece acts as a web or shell to hold together the coco dust as potting medium. There are other advantages in using coconut husk for air-layering. 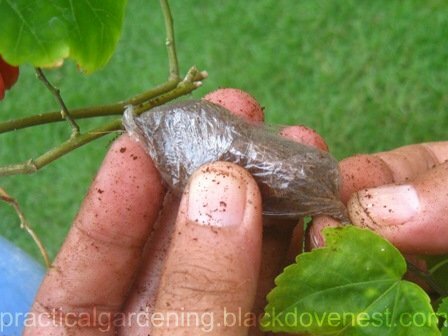 When packing the potting medium material around the plant's wound, form the material into a ball with your fingers, so that the potting medium is mostly surrounding just the wound. This will allow you to have tapered ends at the top and bottom of the marcot ball. When will the marcot or air layer take root? The Chinese Bell flower roots in about 7 to 10 days. 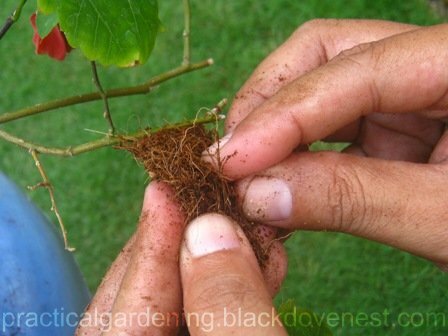 Other plants that have thicker woodier stems form roots much longer. 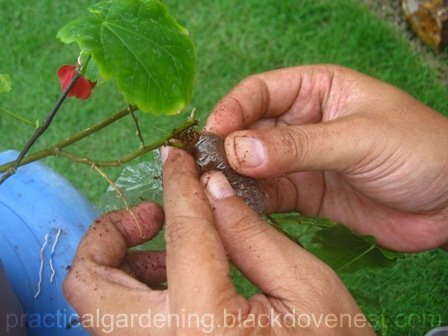 Typically, the rooting time will be about 4 to 6 weeks for most plants. 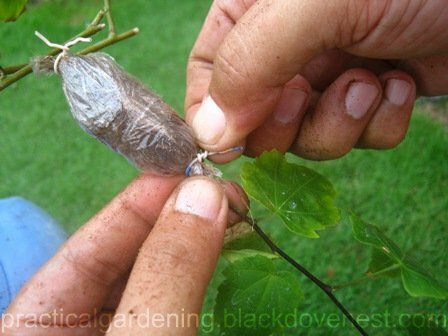 Thereafter, you will be ready to harvest and pot the air layered branch. Thank you. And thanx for dropping by. Do tell your friends and spread the news! Thanks for this wonderful blog. I've learned a lot. Hope you can write more about gardening. Btw, you gave me an idea for the hanging plants. Good for you! Spread the news, and thanx for stopping by. Hi. Thanks for this blog. It really hepls me a lot, specially in practicing this methods and techniques.